MICHIGAN TRUTH SQUAD ANALYSIS: "Why People Are Voting Yes on Proposal 6"
"The People Should Decide, As Simple As That"
The People Should Decide is a ballot question committee funded, according to available campaign finance statements, almost entirely from interests linked to Ambassador Bridge owner Manuel Moroun and his family. Proposal 6 is a constitutional amendment to require a public vote before the state of Michigan could participate in an international bridge or tunnel project. The proposal is aimed at the Next International Trade Crossing, a bridge between Detroit and Windsor that will compete with Moroun’s Ambassador for freight and passenger traffic. Questionable statement: "It may end up being free during their term in office, but eventually we the people are going to be paying big for it." The primary line of attack used by Moroun interests against the NITC project has been the "public will pay" claim. As far back as 2010, the government of Canada extended an offer to cover Michigan’s $550 million share of initial costs for the project, which Canada would cover with tolls. That offer, along with a pledge by Canada to cover the bills should tolls prove insufficient, is incorporated in the agreement signed June 15. Questionable statement: "Quit being so arrogant with our money." What money? The ad does not say. The agreement between Michigan and Canada places the financial onus of the NITC project on the Canadian and U.S. governments (the federal government will fund the cost of the customs plaza on the Michigan side of the bridge). The Michigan Department of Transportation calculated that $42 million has been spent on studies and planning regarding a second Detroit-Windsor bridge. Questionable statement: "That’s our money that the politicians are spending." Again, "our money" is not explained. Questionable statement: There’s a huge Michigan debt clock that’s ticking and getting bigger all the time." This is a new claim from the Moroun camp. The phrase "debt clock" evokes the ongoing national debate over the federal debt and websites, such as this one, that track its movements. The most recent comprehensive financial report for state government, for the year ending Sept. 30, 2011, reported, "The state’s total long-term bonded debt as of September 30, 2011, was $7.3 billion, an increase of $268.6 million from the prior year. The increase represents the net difference between new issuances, payments, and refundings of debt." Between fiscal 2010 and fiscal 2011, the state's total liabilities grew by about $800 million. During the same span, the state's total assets grew by about $1.4 billion. Michigan’s general bond rating, from the rating agency Standard & Poor’s, was AA- in May 2012, down from a rating of AAA (the highest) in 2002. It is not clear how this reference applies to the NITC project or Proposal 6 since the state of Michigan, under the June 15 agreement, is not incurring debt. Questionable statement: "We can’t go out and start building bridges. Our grandkidsare going to have to pay that off." See above on reference to agreement between Canada and Michigan for Canada to cover bridge project’s costs. For context, the Michigan Department of Transportation says it owns 4,407 National Highway System structures greater than 20 feet long. A count including all agencies of NHS bridges longer than 20 feet yields 10,967. Questionable statement: "How can they tell us there’s no money for education and schools, but there’s money for a bridge." 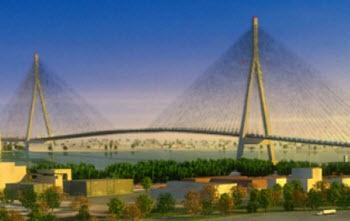 Again, the June 15 agreement puts the onus on Canada to fund construction of the bridge project. The Legislature has not made an appropriation for construction costs for NITC. The state funds "education and schools" primarily through the School Aid Fund, a restricted state account. Questionable statement: "Somebody’s going to end up paying for that bridge, and it’s going to be our children." Again, there is no explanation for this claim. Canada is pledged to finance construction, including Michigan’s share, and recover its investment via tolls collected. If tolls are insufficient, the June 15 agreement puts Canada in charge of covering the difference. Questionable statement: "Do you know how many police, firefighters, teachers, could we hire with the money they’re going to spend on this bridge?" Gov. Rick Snyder negotiated with the federal government to allow Michigan to use the $550 million state "share" (which Canada is covering) toward the state’s total investment for federal matching funds for highway work. As detailed in this report from the Center for Automotive Research in Ann Arbor, that deal will mean $2.2 billion in federal highway funds – which can be spent across the state. Such federal funds, in theory, would lessen pressure on state lawmakers to appropriate money from the state general fund for road work – general fund money that also can be used to bolster police, fire and school ranks. For further context, Moroun family interests have been the primary funders – say the most recent campaign documents available – of Proposal 5, a constitutional amendment that would require supermajorities of the Legislature to enact tax changes. If Prop 5 passes, the likelihood of investments in new police officers, firefighters and teachers will be less, not more. Overall impression: The battle over a second bridge is about money – the Moroun family’s money. The expectation is that a second bridge will reduce traffic on the existing Ambassador, thereby costing the Moroun family money. There is a reason that the family interests have spent millions in campaign contributions, lobbying efforts and TV ads in recent years to stop the NITC project – not to mention what sums have been spent by Moroun interests in legal challenges to the project. Michigan voters may want to ask themselves one question : Why are Moroun family interests spending millions to "protect" the average taxpayer? Foul or no foul: Flagrant foul. These ads repeat claims, or advance new variants of old claims, that do not match available documents. The agreement with Canada puts the financial onus on Michigan’s neighbor, not Michigan, for paying the bills, including interest. Since Michigan is not appropriating construction dollars, no dollars are being diverted away from other public uses. Michigan is not increasing its debt load with the NITC project. Has anyone from the Truth Squad actually read the Agreement to find out that it is not legally enforceable? Canada can walk away any time it wants. And that's the truth! Just ask the Michigan Solicitor General. Joe, Canada actually wants the bridge, as do almost ALL business people in both countries. Construction has already begun on the Cdn. side. We will not walk away at this point. Too much time, money has been spent and infrastructure been added/altered to stop. There are no altruistic ideals other than money on Moroun's part. He couldn't care less for his fellow Michiganders and could care even less than that for us Windsorites/Canadians. He's been lying for years about this project and has been lobbying (re: bribing?) politicians for longer. Wake up Michigan! Someone needs to call in another "Truth Squad" into check the work of TCFM's own Truth Squad. Among the problems with your analysis: Questionable statement: “Quit being so arrogant with our money.” What money? The ad does not say. The agreement between Michigan and Canada places the financial onus of the NITC project on the Canadian and U.S. governments (the federal government will fund the cost of the customs plaza on the Michigan side of the bridge). The Michigan Department of Transportation calculated that $42 million has been spent on studies and planning regarding a second Detroit-Windsor bridge. What money? You've already acknowledged that MDOT has already spent $42-million of Michigan Taxpayer money on a project that lacks substantial public support. You've already acknowledge that the federal government will build the customs plaza (instead of using the woefully understaffed one it has already built). You've "overlooked" that $550-million in "free money" from Canada will be used as Michigan's match on what? Oh yeah, federal funds. And tell me exactly where did the federal government got that money from again? "Questionable statement: “That’s our money that the politicians are spending.” Again, “our money” is not explained." See above. "Questionable statement: There’s a huge Michigan debt clock that’s ticking and getting bigger all the time.” This is a new claim from the Moroun camp. The phrase “debt clock” evokes the ongoing national debate over the federal debt and websites, such as this one, that track its movements. The most recent comprehensive financial report for state government, for the year ending Sept. 30, 2011, reported, “The state’s total long-term bonded debt as of September 30, 2011, was $7.3 billion, an increase of $268.6 million from the prior year. The increase represents the net difference between new issuances, payments, and refundings of debt.” Between fiscal 2010 and fiscal 2011, the state’s total liabilities grew by about $800 million. During the same span, the state’s total assets grew by about $1.4 billion. Michigan’s general bond rating, from the rating agency Standard & Poor’s, was AA- in May 2012, down from a rating of AAA (the highest) in 2002. It is not clear how this reference applies to the NITC project or Proposal 6 since the state of Michigan, under the June 15 agreement, is not incurring debt. You're only off by a factor of ten. But why should that matter when taxpayers can be shaken down to pay the bill? According data from USDebtClock.org, Michigan's debt accrued from all of its various liabilities combined is over $83-billion dollars (and rising). http://usdebtclock.org/state-debt-clocks/state-of-michigan-debt-clock.html "Questionable statement: “How can they tell us there’s no money for education and schools, but there’s money for a bridge.” Again, the June 15 agreement puts the onus on Canada to fund construction of the bridge project. The Legislature has not made an appropriation for construction costs for NITC. The state funds “education and schools” primarily through the School Aid Fund, a restricted state account." States cannot enter into agreements with foreign nations. It is specifically prohibited by the US Constitution. Lansing may have temporarily protected us by prohibiting appropriations for the NITC, but when Gov. Snyder's "agreement" is ruled null and void, and the project is substantially underway despite public opposition, who will be left holding the check? Good luck finding a judge who agrees with TCFM's analysis. I would not be surprised if Joe Blog and KG-1 have last names of Moroun. All proposals that are on the ballot this november are backed by special interest groups, a very, very small minority of citizens of the state. They are only concerned about themselves and not the state as a whole. I vote NO on all the proposals. I'll tell you what, M.S. You go ahead and show me where I'm wrong in my post. Go ahead. If the best you (and the guv) can do is to try to claim that I'm Matty (which, I'm not) or related in any way to his family, you've already lost. Unregulated monopolies are to be avoided anywhere they pop up.. I can understand why the Marouns are battling to preserve their bridge monopoly because it generates huge profits. as does any business that operates without competition. Asecond bridge would provide that competion and, with it, resonable tolls. The only voters who have an incentive to vote "yest" have "Maroun" as their last name. Thank you sooooooooooo much for the "Truth Squad". It helps so much to know (without having to personally study all the different laws, policies, etc that we would need to study on our own) who are liars, who is stretching the truth, and who is telling the truth.